While going through paperwork at my grandmothers we cam across this interesting receipt. It's from an old funeral in New Zealand, dated 1981. I found this document fairly interesting and useful. The total cost was $1,062.80, nothing like what it would cost today. The dollar was certainly different even in the 1980s. 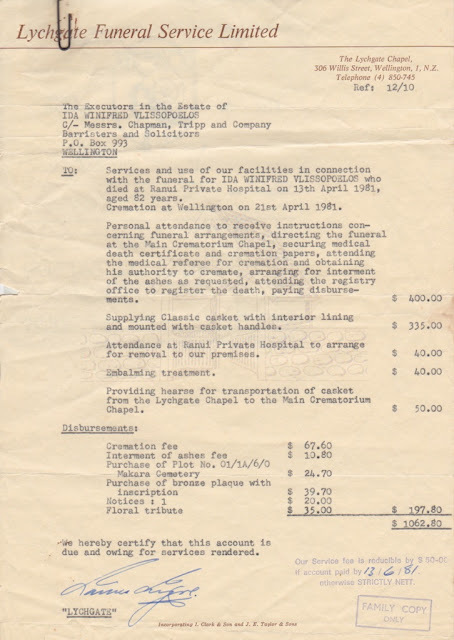 The single biggest cost was the services fee at $400, followed by the cost of the coffin at $335. In other words providing staff, doing paperwork, organising the event and so on was only $25 more than the coffin. This is really not much difference, so perhaps it was an expensive coffin or a cheap service fee. Interestingly the hearse was only $10 more than the transfer cost, and further more it was a separate cost to the services fee. As I understand it the hearse is part of the service fee now, yet apparently it was a separate cost in New Zealand in 1981. I also found it odd that they charged $40 for embalming. This is quite a bit of money compared to everything else. So why did they embalm the body? The body only went to a crematorium and only a few days after death. There was no need to embalm anything. Yet the body was embalmed and at a fair cost. I have heard New Zealand is very into embalming. This goes to show that embalming is not a particularly new fad in New Zealand. Obviously there have been unnecessary embalming for about 30 years. The other striking thing is the age of the document. It is only 30 years old, yet I see it as a historic artefact A window into the past of the funeral industry. It really highlights the fact that time is relative. The 1980s is not even a lifetime ago, yet it might as well be the 1880s to me. It also supports my theory that the funeral industry has not changed as muchas many would think. Many argue that the funeral industry is cold and corporate now. But I do not think it was anything else. The push of unnecessary add ons (such as embalming) and the current billing process was in existence over 30 years ago. A whole decade before the "corporate funeral companies" such as InvoCare were around. I believe funeral homes have been corporate businesses as long as they have existed. Either way, it is a rather interesting document and a lucky find.